Wayne's been busy. One of his recent projects was to finish woodstove refinishing. In October, he did the surface with Tremclad High Heat Enamel that resists heat up to 650°C (1200°F). It's thick and covers well. Brush strokes smooth out during the drying process for a smooth finish. There was plenty of paint left to do the the stove chimney pipe all the way to its exit on the cabin wall. As you can see, the stovepipe was in need of some major TLC. After Wayne finished painting it, he still had enough left in the can to give the stove surface a second coat. Even with daily fires since October (almost 24/7), there have been no cracks or peeling. Tremclad seems to be the perfect product for the job. Through the trees up on the hill, you get a slice of Hole in the Wall and our log boom with its floating stump collection. 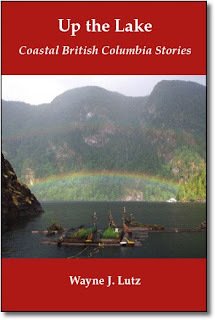 The Powell River region was first inhabited by members of the Sliammon First Nation. 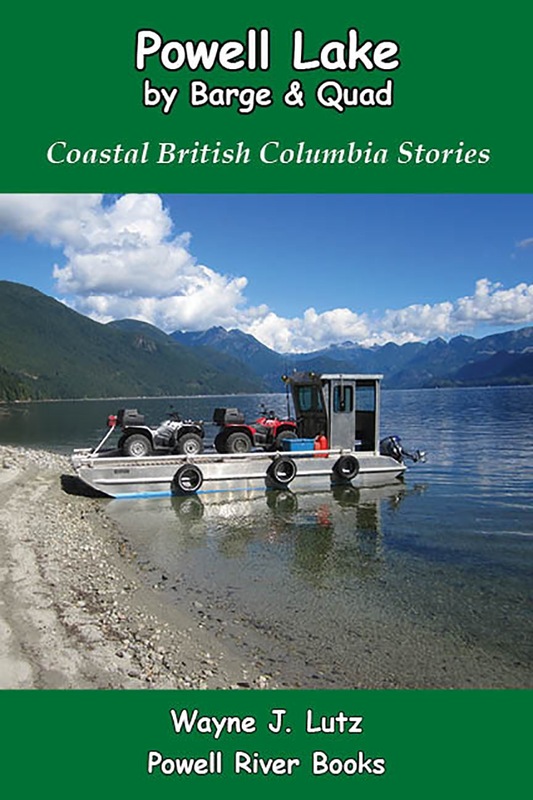 It had everything they needed for a good life: a freshwater lake and river, surrounding forest for food and building materials, the ocean for food and transportation, and warm summers and mild winters. By the 1880's, loggers were drawn to the pristine forests to harvest the massive old growth trees. Word got out about the wonderful natural resources. 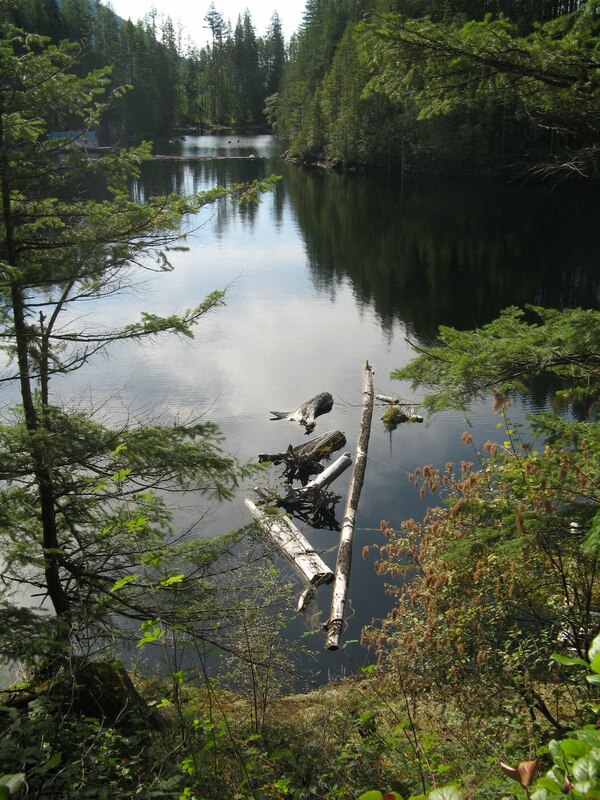 In the early 1900's, the remote site was transformed almost overnight into a pulp mill with its own company town. In 1912, the first roll of paper came off the machines and mill workers were living in brand new homes in what is now called the Historic Townsite. By the 1930's, it was the largest paper mill in the world. Homes for the large workforce and supporting businesses spread to the communities of Wildwood, Cranberry, and Westview. 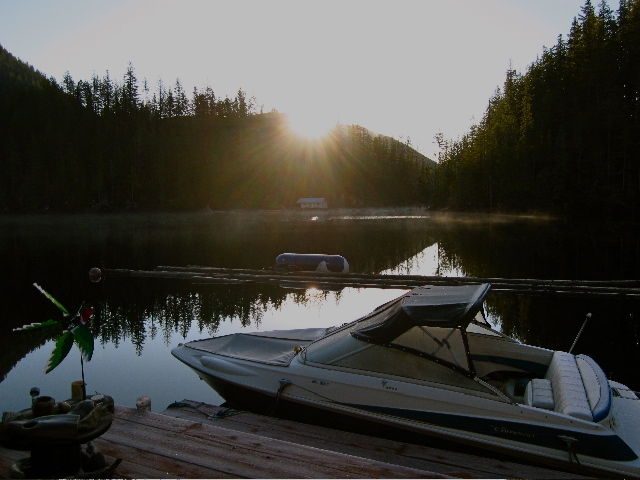 On the shortest day of the year, the sun cooperated and we were able to get an accurate measure of sunrise and sunset at the cabin. Standing on our porch looking due south, this is what we saw. 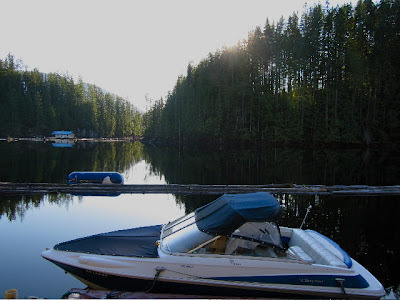 The sun rose above the ridge and treetops at 9:45 a.m, and it promptly set behind the trees surrounding our neighbour John's bay at 11:43 a.m.
That's a little less than two hours of direct sunlight, if it's not a cloudy or stormy day. 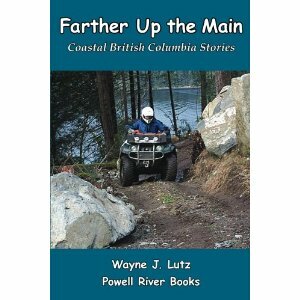 Living in Powell River we have both fresh water (Powell Lake) and salt water (Strait of Georgia) at our doorstep. That makes it a perfect place for boating, kayaking, fishing, scuba diving, skiing, and all kinds of water sports. When I stay at the condo in town, I look straight across the strait to Vancouver Island. I can see the beacon on Rebecca Rock blinking to warn mariners of the extensive underwater (and above) dangers. Official winter is almost here, but freezing nights can't seen to wait. Most of my garden plants are annuals, so I don't worry about saving them. But there were two that I felt needed a try this year. First was my rhubarb root. It's in a medium sized pot on the transition float and I worry about it not having enough soil for protection. 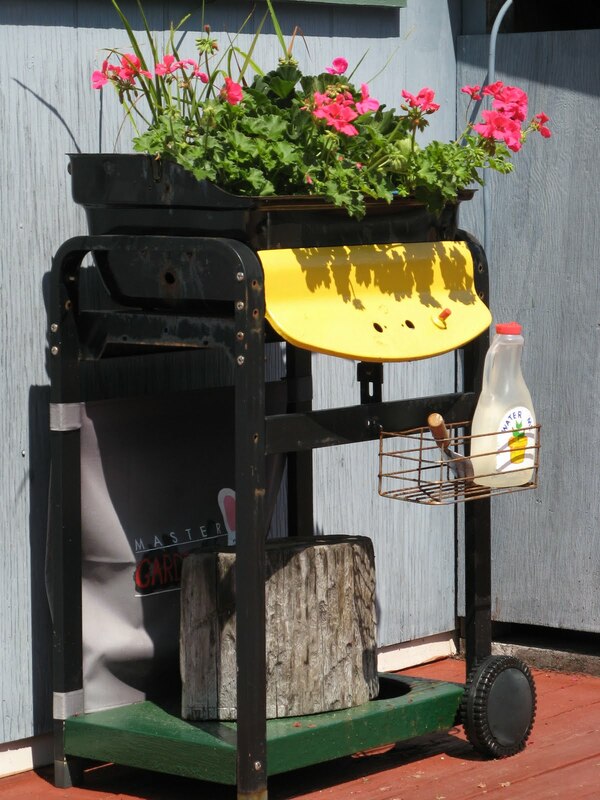 The other was my beautiful geraniums in the repurposed BBQ planter. I enjoyed them so much this year I thought maybe they could survive with a little help. I used the same method for both. First, I hired the local wood rat to trim everything back (just kidding, she did it on her own.) I didn't have any mulch handy, so I used crumpled newspaper to give the surface of the soil an uneven cover, hopefully creating air pockets to keep the surface, roots, and stems from freezing. 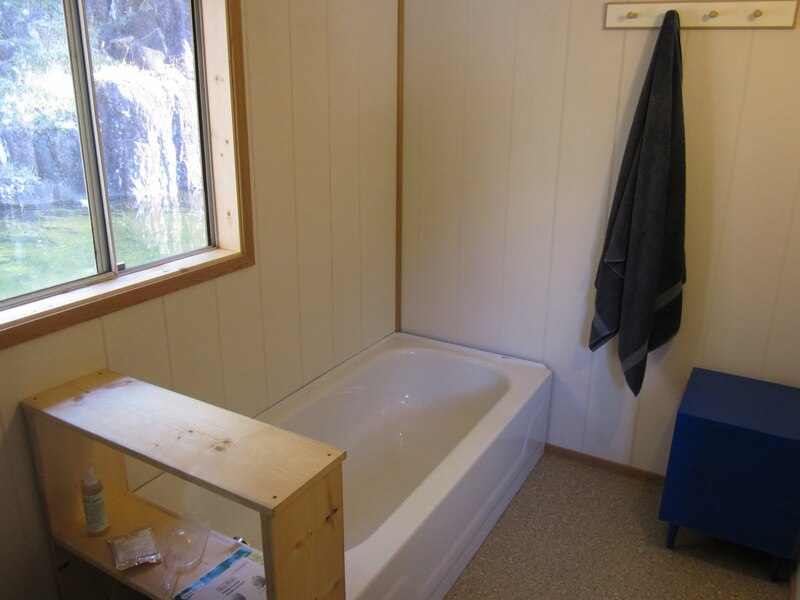 When John was remodeling for us, he moved our bathtub from the storage room to the new bathroom. One challenge he encountered was the tub's direction. In the storage room, it was a left hand installation. Now it needed to go right, leaving the tub's end open and quite ugly. Rather than adding a panel to close the hole, he built a simple storage shelf. John had a leftover 1 by 12 of finished pine. A few cuts, screws, and the tub now has an attractive, and functional closure. The natural wood matched the window frames, but I wanted a bit more colour in the room. 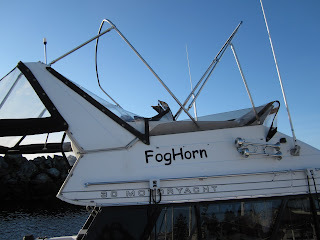 On a recent trip to Steveston, BC, I strolled along the docks to look at the fishing boats. Nearby there was a raucous group of birds begging for food. Among the many seagulls there was one large bird. I didn't know what kind of bird it was, so I did some research online. I now believe it is a juvenile Mute Swan. Red sky in the morning, sailor's warning. It may be a sign that a storm is on the way, but the sight is still a delight. I woke up at dawn and watched this gorgeous display right out my bedroom window last Monday. John is like a magician at everything he does. I let him know what I need and he makes it happen like magic. Our kitchen storage counter and shelf are two examples. As a part of our kitchen remodel we decided to get rid of our dining table (which we never used for eating) and replace it with a storage unit (which is what we really needed). I drew a design with the dimensions and gave it to John. A week later, Wayne and I picked it up at John's house. Under our new outdoor porch out of the rain, we got it painted with two coats of semi-gloss white to protect the surface and to blend into our existing kitchen colour scheme. The wide open area on the side was designed to stack cases of pop and other large items. Sunday was sunny, and the winds were gentle out of the northwest, a perfect day to take our new boat out for a spin on the Strait of Georgia. Living just above the harbour makes it easy. We walked down to the dock and off we went. We first headed out to Rebecca Rocks, but outside of the protection of Harwood Island, the swells got larger, so we decided to head over to the Hulks to see if there were any Steller sea lions at the breakwater. You can read more about the Hulks that make up the Catalyst paper mill's breakwater here. Inside their protective circle, the mill can dock their incoming barges of pulp and outgoing loads of paper. 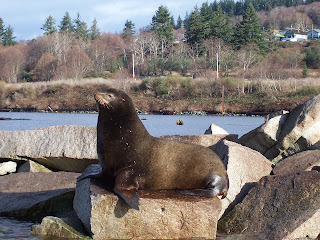 Each winter, Steller Sea Lions make the long trek from California to hang out in the nutrient rich waters of the Strait of Georgia. We may dream of heading south for warm sandy beaches, but not these guys. From our condo, we can hear them barking in the early morning light. As Grizzly in Bella Coola said, through mid-December is the worst time for storms off the Pacific with strong winds. The same is true here in Powell River. 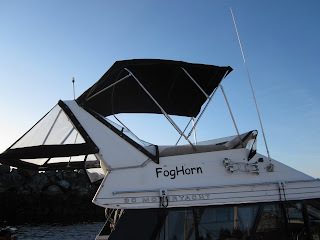 When Wayne came down the lake and checked on our boat in the harbour, here's what he found. Instead of a canvas top with side enclosures, all he could see were poles looking like tree limbs stripped of their leaves. After securing the command bridge for several days with cover, he set out to find a place to repair the canvas enclosure. There are several in town, but Wayne chose TJ's. What a find. The workmanship was excellent, the turnaround time speedy, and the price very reasonable. A triple header! 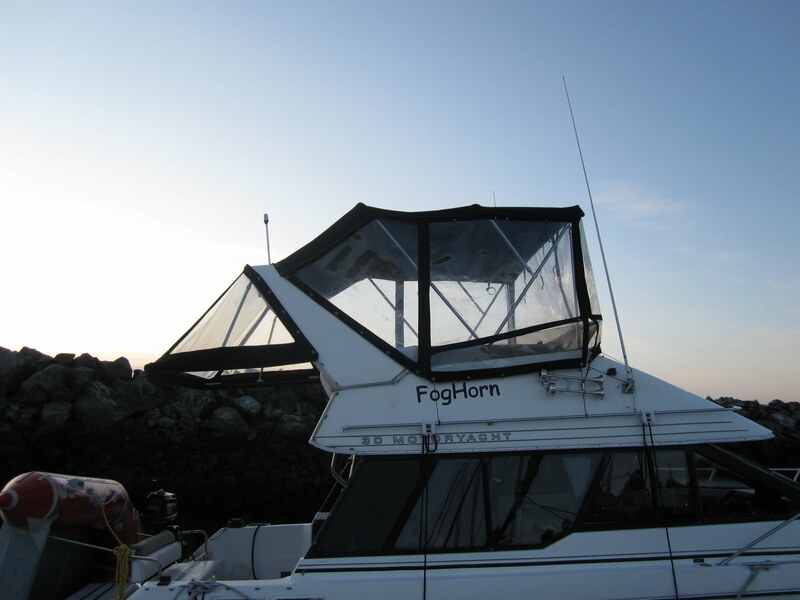 Todd Stanhope of TJ's Boat Tops diagnosed the problem as old (1992) zipper seam stitching that couldn't hold up against the strong storm wind. Once the zippers gave, the wind had her way with the canvas and plastic sides. Fortunately nothing was really damaged. Todd's knowledge and experience helped us save our top. 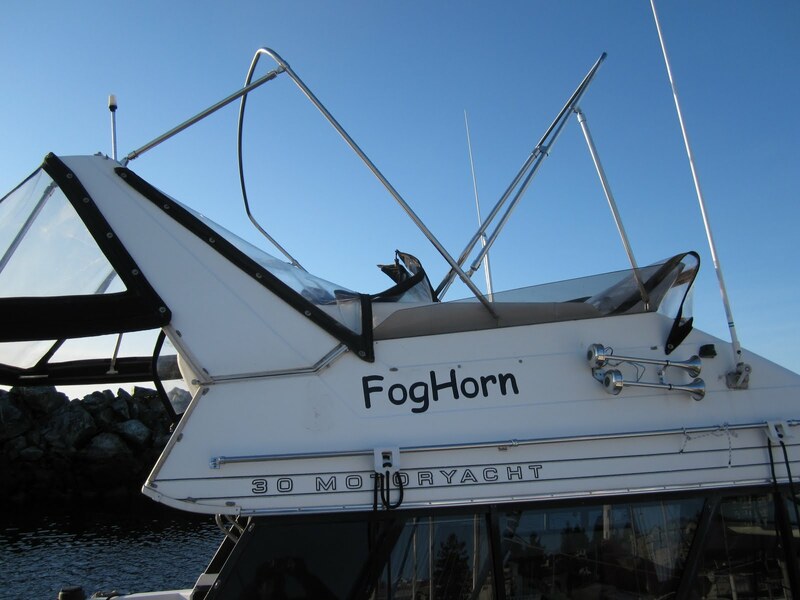 If you have a boat in Powell River, or are boating along the Sunshine Coast and Desolation Sound, give Todd at TJ's Boat Tops a call. 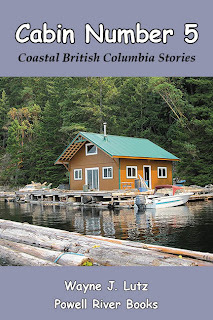 In 2008, I discovered a great blog about simple living in small dwellings. 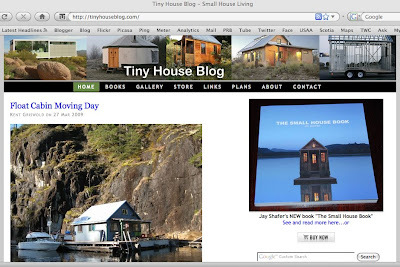 The Tiny House Blog is designed, written and lovingly maintained by Kent Griswold. The most recent article, just posted today, is called "Indoor Plumbing with a Twist." 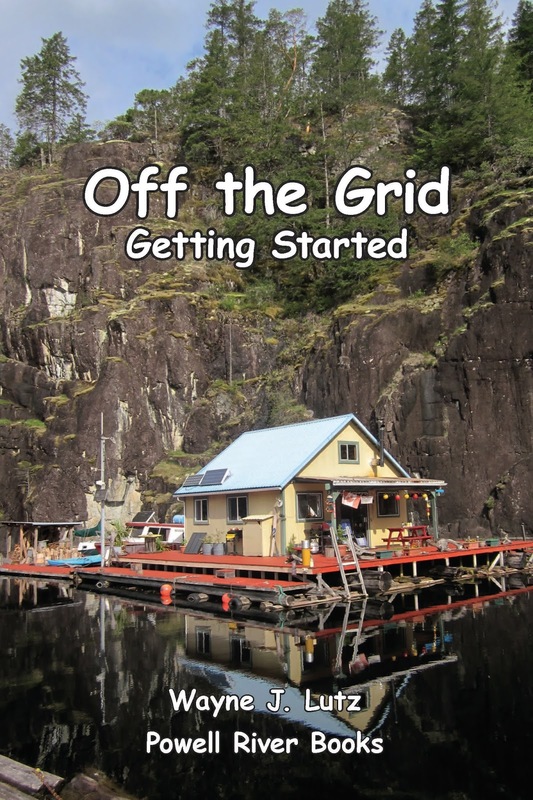 It chronicles the building of a bathroom and side porch addition to our float cabin. I really appreciate all the support Kent gives to people who are living, or would like to live, in small homes. 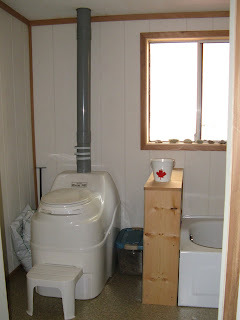 Head on over to TinyHouseBlog.com for the rest of my story and many more like it.